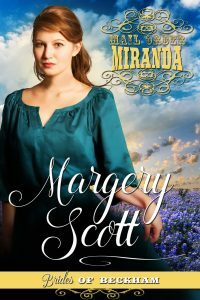 Miranda Lowe knows she isnâ€™t the kind of woman men want to marry, but when she loses her family, her home and her job on the same day, she sees no other choice but to offer herself as a mail-order bride to a widower in Sapphire Springs, Texas. John Weaver needs a mother for his five-year-old twin daughters. He has no intention of falling in love again, and as long as the woman who agrees to marry him understands that, they can have a good life together. So why is John suddenly thinking about changing the rules? And why is Miranda willing to do whatever it takes to become the kind of woman John could love? Can John and Miranda find a way to come together and build a real family? Â Â Â Â Â Miranda Lowe muttered an unladylike word as the kindling tumbled down into a heap, taking the pile of coal sheâ€™d so carefully placed with it. The coal shattered on the marble hearth, crumbs exploding into the air. For some reason, today her fingers were all thumbs and she couldnâ€™t seem to build a fire even though she did it a dozen times every morning. Â Â Â Â Â â€œWhy arenâ€™t you finished lighting the fires yet?â€ The shrill voice echoed off the walls of the Tolliver mansionâ€™s drawing room. Mrs. Tolliver marched across the room toward Miranda. Her hawkish gaze slid down Mirandaâ€™s length, her lips thinning. Â Â Â Â Â Mrs. Tolliver spun around and walked away, her footsteps muffled on the thick carpet. Â Â Â Â Â Miranda knelt back down on the hearth to finish setting the fire in the massive stone fireplace. Â Â Â Â Â â€œI expect all the silverware to be cleaned and the guest rooms to be done and aired out before the guests arrive as well,â€ Mrs. Tolliver called out behind her. Then the door slammed. Â Â Â Â Â Miranda sighed. This was to be her lot for the rest of her life, she supposed. The head housekeeper wasnâ€™t even close to retirement, not that sheâ€™d want the job anyway. She couldnâ€™t imagine herself ordering people around and being in charge of anything. Hadnâ€™t she been told her whole life that she wasnâ€™t pretty enough or smart enough to amount to anything? Â Â Â Â Â The door opened and Lily, her best friend and one of the other maids in the Tolliver household, walked in carrying a dustmop. â€œHer Highness is really on the warpath this morning, isnâ€™t she?â€ she said after making sure no one was within earshot. Â Â Â Â Â Miranda smiled at her friend. Finding a husband was as likely as finding a pot of gold at the end of the rainbow, she mused. How was it even possible to meet a man when she worked fourteen hours a day, every day except Sunday? And even then, she only got four hours off, long enough to go to church and have a short visit with her sister who lived a few blocks away. Â Â Â Â Â She arranged the kindling back in the fireplace on top of the newspapers and piled the coal on top. Reaching into her apron pocket, she dug out a box of matches, then struck one and held the flame against the paper until it caught fire. Â Â Â Â Â She sat back on her heels for a moment, watching as the flames licked at the kindling. Then, satisfied the fire wasnâ€™t going to go out, she got to her feet and swept up the mess sheâ€™d left on the hearth. Â Â Â Â Â Suddenly, the door burst open and one of the kitchen maids rushed in. It was unusual to see any of the kitchen staff upstairs in the house. Miranda gave her a curious glance. Â Â Â Â Â The coal scuttle fell from Mirandaâ€™s hand, clattering on the hearth. Coal spilled out, spewing coal dust onto the floor and into the air. Â Â Â Â Â Her shoes clicked on the marble floor as she raced through the hallways and down the stairs to the kitchen and the back door. Â Â Â Â Â A light drizzle was falling when Miranda stepped outside, but she didnâ€™t want to take the time to go back to her small room on the third floor to get her umbrella. She needed to get to Beth as quickly as possible. Â Â Â Â Â Miranda had taken care of Lily since their parents were killed in a carriage accident five years before. Miranda had been lucky enough to find employment in the Tolliver household and Beth had begun working in one of the factories in Beckham when sheâ€™d finished school. Sheâ€™d fallen in love with the ownerâ€™s son, a scoundrel whoâ€™d ruined her and left her expecting his child. Â Â Â Â Â Beth had been fired from her job and Miranda had used all her savings to support her. Now, finally, the baby was coming. Soon, theyâ€™d be able to leave Beckham and build a new life somewhere far away where no one knew about the child. Â Â Â Â Â Miranda ran the whole way to the rooming house where Beth lived and climbed the stairs to the third floor. A small, stout man with mutton whiskers and ruddy cheeks and a woman with a mop of frizzy white hair were standing outside Bethâ€™s door. Â Â Â Â Â â€œAre you Miranda?â€ the man asked. Â Â Â Â Â â€œI am,â€ she replied, her breaths coming in short gasps. Â Â Â Â Â Miranda saw the doctorâ€™s lips moving, but the pounding of her pulse in her ears drowned out his words. The world spun, and she sank to the floor.